Salmon is fast becoming the new chicken. Once an occasional treat, salmon is now a regular item on restaurant menus, a favourite at dinner parties and a necessary part of the canapé platter. Its popularity is partly due to the fact New Zealand farmed salmon is a high quality product, so much better than the flabby farmed salmon I’ve encountered in Europe and, I think, better than the Atlantic salmon from Tasmania. In NZ we farm the chinook or king salmon. It was introduced in the early 1900’s and has thrived in an environment that’s free of the parasites specific to the species. That means we don’t have to dose our farmed salmon with antibiotics. We are also lucky in that we have an extensive coastline with deep sheltered waterways and good tidal flows – perfect conditions for aquaculture. New Zealand has also pioneered the raising of salmon in fresh-water hydro canals. Our alpine salmon is superb, apparently because the fish are constantly exercising their muscles by swimming against the fast flowing glacial currents in the canals. There is nothing flabby about these fish. Alpine king salmon is the fish used by Sealord in its new range of hot smoked salmon. Unlike cold-smoking, hot-smoking cooks and smokes the fish at the same time. Sealord, despite being the second biggest seafood company in the country, is using a traditional smokehouse with manuka wood chips to create a more artisinal product that is very good. Its Manuka Smoked Salmon took out the Supreme Award at the NZ Food Awards 2014. 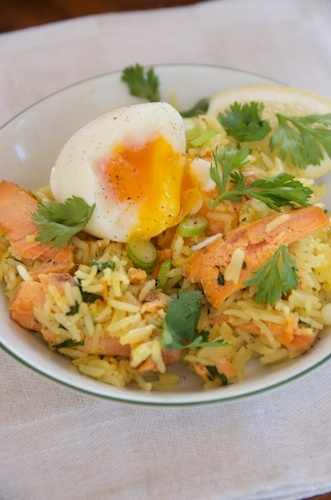 I’ve used Sealord’s Peri Peri Hot Smoked Salmon in the following recipe for kedgeree, its mild chilli flavour goes well with the spices that flavour this Anglo/Indian dish. If you want more of a kick, add more cayenne. Rinse the rice and place in a pot with the water. Bring to a boil then immediately lower heat to a slow simmer. Cover the pot with a lid and allow rice to cook for 12 minutes without removing the lid. Remove from heat and keep covered for a further 10 minutes until all the liquid is absorbed. Soft-boil the eggs for 6 minutes and set aside to cool before peeling off shells. Heat the oil in a high sided frying pan and cook onion, garlic and ginger over med-low heat until softened but not browned, about 3 minutes. Stir in turmeric, coriander and cayenne and cook for a further minute. Add butter and when melted, add cooked rice, flaked salmon and cream. Stir to combine and heat through. Add fresh coriander and season to taste. Serve topped with a soft boiled egg and a scattering of coriander leaves. Makes 2 main servings or 4 small plates (as pictured). Love your blog Anna…and now w/recipes – perfecto! Thanks for keeping us all up to date w/the latest news! Wow, so glad I found you and your food writting again. Via facebook.